The Australian city of Melbourne has beaten Canada's Vancouver to the title of world's most liveable city for the first time in almost a decade. Vancouver has topped the annual Global Liveability Survey since 2002, but this year fell to third behind Vienna. 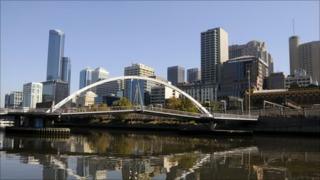 Overall, Australian and Canadian cities did well, capturing seven of the top 10 spots. Harare, Port Moresby and Dhaka occupied the bottom of the table. The cities were assessed in five categories - stability, healthcare, culture and environment, education and infrastructure. Vancouver missed out on the top spot because its infrastructure score had fallen due to periodic closures of a key motorway. London was ranked 53, out of 140 cities surveyed. Honolulu, at 26, was the top US city. The Economist Intelligence Unit, which carried out the survey, said scores in Europe had been pushed slightly down by the eurozone crisis, while the Arab Spring had affected ratings across the Middle East and North Africa. "Australia, with a low population density and relatively low crime rates, continues to supply some of the world's most liveable cities," report editor Jon Copestake said in a statement. "Despite the rising cost of living driven by the strong Australian dollar, these cities offer a range of factors to make them highly attractive." Melbourne was a joint winner with Vancouver in 2002. Mayor Robert Doyle said he was "absolutely delighted" with the news. ''For the first time in a decade we are now officially ranked number one,'' he said. ''When you think the strong Aussie dollar militates against this, this is even more impressive." Cities were scored out of 100 and the report noted that the top 10 cities were only separated by 1.8 percentage points.